Scare campaign by BJP? Modi had better deny this publicly else the international media will tear into him. Freedom of expression has long been on the back foot in India. In Modi’s India things have gotten from bad to worse. Someone has been sharing this on Whatsapp. This has all the hallmarks of a scare campaign. Appeal to all group members is that no group member should forward photo of Sonia, Rahul, Modi, Kejriwal or any political leader or political party. In Pune, Mumbai, Chennai & Delhi, more than 260 group admn have been sent to jail. Police are watching whatsapp. One urgent appeal to pay attention….! All are being Informed that the cyber crime has started watching all group folders. You delete either the group formed by you or warn the group members. Do not post any kind of messages which ridicule religious, political, social system or bad pictures or videos. 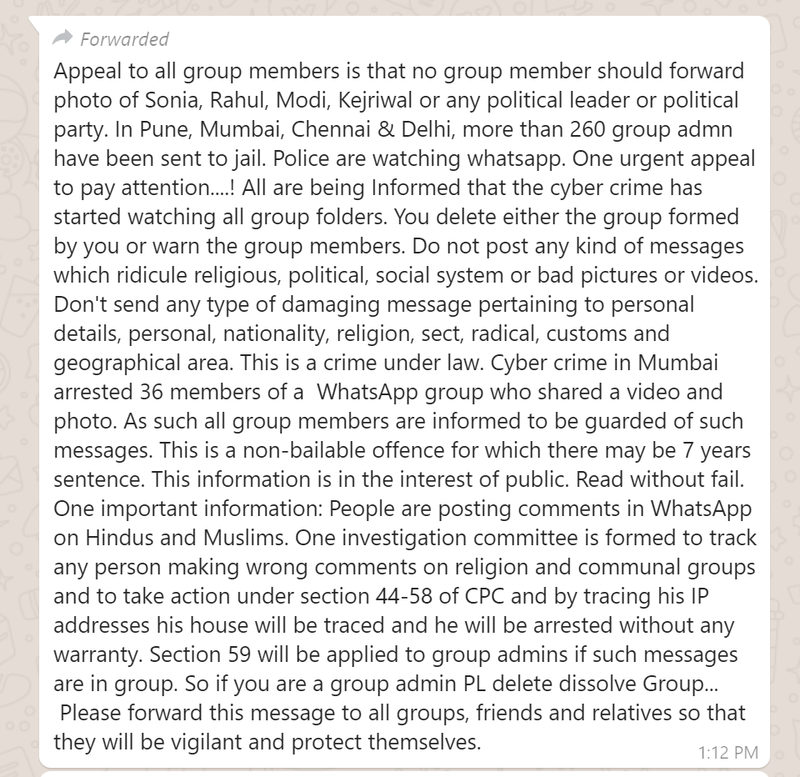 Please forward this message to all groups, friends and relatives so that they will be vigilant and protect themselves. The way this has been drafted it appears to have come from BJP’s IT Cell. The threat implied to India’s democracy in such Whatsapp messages is intolerable. The text in this message is entirely illegal and has been drafted to stifle genuine debate and any other discussion. NO RESTRICTIONS ON POLITICAL DEBATE EXIST UNDER ANY INDIAN LAW. India is a democracy and there is completely freedom to discuss politics. If any attempt is made to scare you, then stand up for your rights. Don’t be a coward. Stand and fight! I believe Mr. Modi must deny its origin from BJP’s IT Cell. He must assure India that free and fair political discussion is fully protected under all Indian laws.